What makes young people—most often young women—inflict damage on their own bodies? Epidemiological studies drawing on surveys have estimated incidence and identified risk factors, but studies that explore the individuals’ experience and understanding of self-harm, which typically comprise a small series of persons, are omitted in many reviews. We conducted a systematic database search of studies on adolescents’ (12–18 years of age) first-person experience of self-harm in clinical and non-clinical populations, and included 20 studies in a meta-synthesis. Four meta-themes were associated with the participants’ subjective experiences of self-harm: (1) to obtain release, (2) to control difficult feelings, (3) to represent unaccepted feelings, and (4) to connect with others. The meta-themes support self-harm as a function of affect-regulation, but also highlight how the action of self-harm may contain important emotional and relational content and an intention or wish to connect and communicate with others. Our findings underline the importance of relating self-harm to developmental psychological needs and challenges in adolescence, such as separation, autonomy and identity formation. Self-harm in adolescence may be a result of a conflict between a need to express affective experiences and a relational need for care. The authors wish to thank Glenn Karlsen Bjerkenes and Hege Ringnes at the University of Oslo, Norway for their assistance with the literature search, and Caryl Gay, PhD at the University of California, San Francisco for proof reading the manuscript. LIS conceived of the study, participated in its design and coordination and drafted the manuscript; HH participated in the design and interpretation of the data; SEG participated in the design and interpretation of the data. All authors read, helped to draft, and approved the final manuscript. The Norwegian Extra Foundation for Health and Rehabilitation and The Norwegian Council for Mental Health provided funding for this study, FO4115. They had no role in the study design, collection, analysis or interpretation of the data, writing the manuscript, or the decision to submit the article for publication. The authors report no conflict of interests. The electronic search strategy was developed in liaison with information specialists at the University of Oslo in December 2016. The methodological search terms were informed by technical guidance and worked examples. Database: Ovid MEDLINE(R) In-Process & Other Non-Indexed Citations, Ovid MEDLINE(R) Daily and Ovid MEDLINE(R) < 1946 to Present>. *Abrams, L. S., & Gordon, A. L. (2003). Self-harm narratives of urban and suburban young women. Affilia-Journal of Women and Social Work, 18(4), 429–444. https://doi.org/10.1177/0886109903257668. *Adams, J., Rodham, K., & Gavin, J. (2005). Investigating the ‘self’ in deliberate self-harm. Qualitative Health Research, 15(10), 1293–1309. https://doi.org/10.1177/1049732305281761. *Crouch, W., & Wright, J. (2004). Deliberate self-harm at an adolescent unit: A qualitative investigation. Clinical Child Psychology and Psychiatry, 9(2), 185–204. https://doi.org/10.1177/1359104504041918. *Gulbas, L. E., Tyler, T. R., & Zayas, L. H. (2015). An exploratory study of nonsuicidal self-injury and suicidal behaviors in adolescent Latinas. American Journal of Orthopsychiatry, 85(4), 302–314. https://doi.org/10.1037/ort0000073. Gvion, Y., & Fachler, A. (2015). Traumatic experiences and their relationship to self-destructive behavior in adolescence. Journal of Infant, Child, and Adolescent Psychotherapy, 14(4), 406–422. https://doi.org/10.1080/15289168.2015.1090863. *Lesniak, R. G. (2010). The lived experience of adolescent females who self-injure by cutting. Advanced Emergency Nursing Journal, 32(2), 137–147. https://doi.org/10.1097/TME.0b013e3181da3f2f. *Lewis, S. P., & Mehrabkhani, S. (2017). Every scar tells a story: Insight into people’s self-injury scar experiences. Counselling Psychology Quarterly, 29(3), 296–310. https://doi.org/10.1080/09515070.2015.1088431. *Marshall, H., & Yazdani, A. (1999). Locating culture in accounting for self-harm amongst asian young women. Journal of Community & Applied Social Psychology, 9(6), 413–433. https://doi.org/10.1002/(SICI)1099-1298(199911/12)9:6<413::AID-CASP543>3.0.CO;2-U. *McAndrew, S., & Warne, T. (2014). Hearing the voices of young people who self-harm: Implications for service providers. International Journal of Mental Health Nursing, 23(6), 570–579. https://doi.org/10.1111/inm.12093. *McDermott, E., Roen, K., & Piela, A. (2015). Explaining self-harm: Youth cybertalk and marginalized sexualities and genders. Youth and Society, 47(6), 873–889. https://doi.org/10.1177/0044118X13489142. *Parfitt, A. (2005). On aggression turned against the self. Psychoanalytic Psychotherapy, 19, 160–173. https://doi.org/10.1080/02668730500115127. *Rissanen, M.-L., Kylmä, J., & Laukkanen, E. (2008). 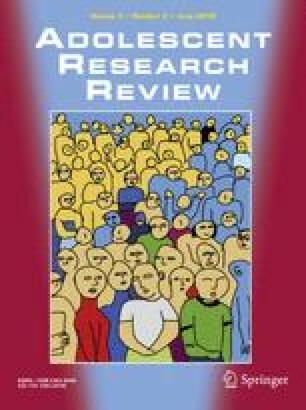 Descriptions of self-mutilation among Finnish adolescents: A qualitative descriptive inquiry. Issues in Mental Health Nursing, 29(2), 145–163. https://doi.org/10.1080/01612840701792597. *Yip, K.-S., Ngan, M.-Y., & Lam, I. (2004). Adolescent self-cutters in Hong Kong. Asia Pacific Journal of Social Work and Development, 14(2), 33–51. https://doi.org/10.1080/21650993.2004.9755953.